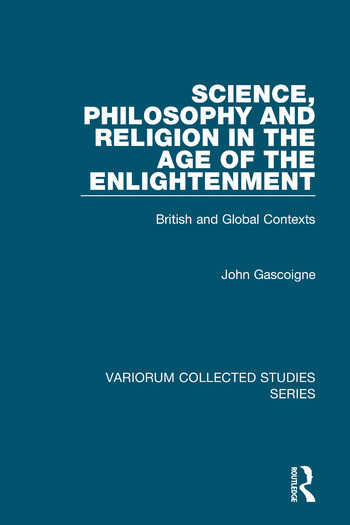 Taking as its focus the wide-ranging character of the Enlightenment, both in geographical and intellectual terms, this second collection of articles by John Gascoigne explores this movement's filiation and influence in a range of contexts. In contrast to some recently influential views it emphasises the evolutionary rather than the revolutionary character of the Enlightenment and its ability to change society by adaptation rather than demolition. This it does by reference, firstly, to developments in Britain tracing the changing views of history in relation to the Biblical account, the ideological uses of science (and particularly the work of Newton) and their connections to developments in moral philosophy and the teaching of science and philosophy in response to Enlightenment modes of thought. The collection then turns to the wider global setting of the Enlightenment and the way in which that movement served to provide a justification for European exploration and expansion, developments which found one of their most potent embodiments in the diverse uses of mapping. The collection concludes with an exploration of the interplay between the experience of Pacific contact and the currents of thought which characterised the Enlightenment in Germany. Contents: Introduction; 'The wisdom of the Egyptians': and the secularisation of history in the age of Newton; From Bentley to the Victorians: the rise and fall of British Newtonian natural theology; Sensible Newtonians: Nicholas Saunderson and John Colson; Science, religion and the foundations of morality in Enlightenment Britain; The teaching of philosophy within the British universities and learned societies of the 18th century; Motives for European exploration of the Pacific in the age of the Enlightenment; Joseph Banks, mapping and the geographies of natural knowledge; Blumenbach, Banks and the beginnings of anthropology at GÃ¶ttingen; The German Enlightenment and the Pacific; The Royal Society, natural history, and the peoples of the 'New World(s)', 1660-1800; Index.